For five months in mid 2017, Emily Mason did the same thing every day. Arriving to her office at NASA's Goddard Space Flight Center in Greenbelt, Maryland, she sat at her desk, opened up her computer, and stared at images of the Sun—all day, every day. "I probably looked through three or five years' worth of data," Mason estimated. Then, in October 2017, she stopped. She realized she had been looking at the wrong thing all along. Mason, a graduate student at The Catholic University of America in Washington, D.C., was searching for coronal rain: giant globs of plasma, or electrified gas, that drip from the Sun's outer atmosphere back to its surface. 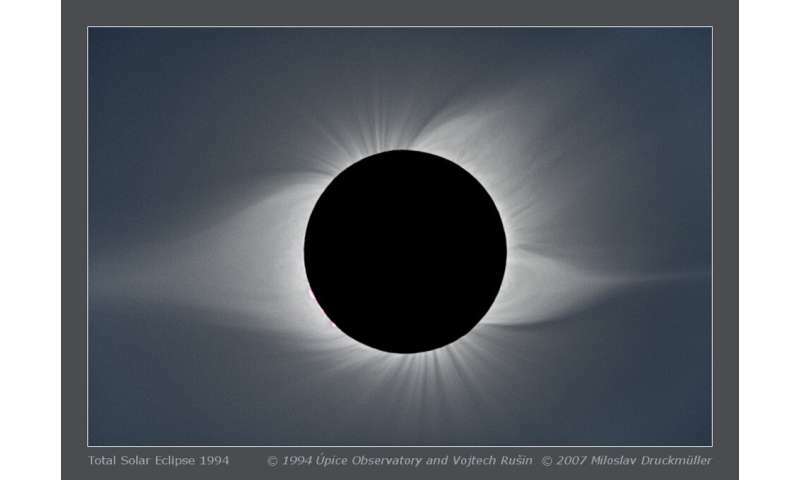 But she expected to find it in helmet streamers, the million-mile tall magnetic loops—named for their resemblance to a knight's pointy helmet—that can be seen protruding from the Sun during a solar eclipse. Computer simulations predicted the coronal rain could be found there. Observations of the solar wind, the gas escaping from the Sun and out into space, hinted that the rain might be happening. And if she could just find it, the underlying rain-making physics would have major implications for the 70-year-old mystery of why the Sun's outer atmosphere, known as the corona, is so much hotter than its surface. But after nearly half a year of searching, Mason just couldn't find it. "It was a lot of looking," Mason said, "for something that never ultimately happened." The problem, it turned out, wasn't what she was looking for, but where. In a paper published today in the Astrophysical Journal Letters, Mason and her coauthors describe the first observations of coronal rain in a smaller, previously overlooked kind of magnetic loop on the Sun. After a long, winding search in the wrong direction, the findings forge a new link between the anomalous heating of the corona and the source of the slow solar wind—two of the biggest mysteries facing solar science today. Observed through the high-resolution telescopes mounted on NASA's SDO spacecraft, the Sun—a hot ball of plasma, teeming with magnetic field lines traced by giant, fiery loops—seems to have few physical similarities with Earth. But our home planet provides a few useful guides in parsing the Sun's chaotic tumult: among them, rain. On Earth, rain is just one part of the larger water cycle, an endless tug-of-war between the push of heat and pull of gravity. It begins when liquid water, pooled on the planet's surface in oceans, lakes, or streams, is heated by the Sun. Some of it evaporates and rises into the atmosphere, where it cools and condenses into clouds. Eventually, those clouds become heavy enough that gravity's pull becomes irresistible and the water falls back to Earth as rain, before the process starts anew. On the Sun, Mason said, coronal rain works similarly, "but instead of 60-degree water you're dealing with a million-degree plasma." Plasma, an electrically-charged gas, doesn't pool like water, but instead traces the magnetic loops that emerge from the Sun's surface like a rollercoaster on tracks. At the loop's foot points, where it attaches to the Sun's surface, the plasma is superheated from a few thousand to over 1.8 million degrees Fahrenheit. It then expands up the loop and gathers at its peak, far from the heat source. As the plasma cools, it condenses and gravity lures it down the loop's legs as coronal rain. The other reason connects to the coronal heating problem—the mystery of how and why the Sun's outer atmosphere is some 300 times hotter than its surface. Strikingly, simulations have shown that coronal rain only forms when heat is applied to the very bottom of the loop. "If a loop has coronal rain on it, that means that the bottom 10% of it, or less, is where coronal heating is happening," said Mason. Raining loops provide a measuring rod, a cutoff point to determine where the corona gets heated. Starting their search in the largest loops they could find—giant helmet streamers—seemed like a modest goal, and one that would maximize their chances of success. She had the best data for the job: Images taken by NASA's Solar Dynamics Observatory, or SDO, a spacecraft that has photographed the Sun every twelve seconds since its launch in 2010. But nearly half a year into the search, Mason still hadn't observed a single drop of rain in a helmet streamer. She had, however, noticed a slew of tiny magnetic structures, ones she wasn't familiar with. "They were really bright and they kept drawing my eye," said Mason. "When I finally took a look at them, sure enough they had tens of hours of rain at a time." At first, Mason was so focused on her helmet streamer quest that she made nothing of the observations. "She came to group meeting and said, 'I never found it—I see it all the time in these other structures, but they're not helmet streamers,'" said Nicholeen Viall, a solar scientist at Goddard, and a coauthor of the paper. "And I said, 'Wait...hold on. Where do you see it? I don't think anybody's ever seen that before!'" "These loops were much smaller than what we were looking for," said Spiro Antiochos, who is also a solar physicist at Goddard and a coauthor of the paper. "So that tells you that the heating of the corona is much more localized than we were thinking." While the findings don't say exactly how the corona is heated, "they do push down the floor of where coronal heating could happen," said Mason. She had found raining loops that were some 30,000 miles high, a mere two percent the height of some of the helmet streamers she was originally looking for. And the rain condenses the region where the key coronal heating can be happening. "We still don't know exactly what's heating the corona, but we know it has to happen in this layer," said Mason. But one part of the observations didn't jibe with previous theories. According to the current understanding, coronal rain only forms on closed loops, where the plasma can gather and cool without any means of escape. But as Mason sifted through the data, she found cases where rain was forming on open magnetic field lines. Anchored to the Sun at only one end, the other end of these open field lines fed out into space, and plasma there could escape into the solar wind. To explain the anomaly, Mason and the team developed an alternative explanation—one that connected rain on these tiny magnetic structures to the origins of the slow solar wind. In the new explanation, the raining plasma begins its journey on a closed loop, but switches—through a process known as magnetic reconnection—to an open one. The phenomenon happens frequently on the Sun, when a closed loop bumps into an open field line and the system rewires itself. Suddenly, the superheated plasma on the closed loop finds itself on an open field line, like a train that has switched tracks. Some of that plasma will rapidly expand, cool down, and fall back to the Sun as coronal rain. But other parts of it will escape—forming, they suspect, one part of the slow solar wind. Mason is currently working on a computer simulation of the new explanation, but she also hopes that soon-to-come observational evidence may confirm it. Now that Parker Solar Probe, launched in 2018, is traveling closer to the Sun than any spacecraft before it, it can fly through bursts of slow solar wind that can be traced back to the Sun—potentially, to one of Mason's coronal rain events. After observing coronal rain on an open field line, the outgoing plasma, escaping to the solar wind, would normally be lost to posterity. But no longer. "Potentially we can make that connection with Parker Solar Probe and say, that was it," said Viall. As for finding coronal rain in helmet streamers? The search continues. The simulations are clear: the rain should be there. "Maybe it's so small you can't see it?" said Antiochos. "We really don't know." But then again, if Mason had found what she was looking for she might not have made the discovery—or have spent all that time learning the ins and outs of solar data. "It sounds like a slog, but honestly it's my favorite thing," said Mason. "I mean that's why we built something that takes that many images of the Sun: So we can look at them and figure it out." Variations of the slow Solar wind could potentially explain the precursor and echo correlations of Gravitational Waves as a mass wave (local 'Dark Energy' factor) working against the 3-D uniform gravitational energy pull of all mass objects near LIGO sensors. This may need 3 vs. only 2 vacuum tube arms to determine the local directional effect of gravitation. See my past posts on this GW related discussion. Jesus, there is some gibberish on here today. WTF has the solar wind got to do with GWs? The solar wind is pathetically diffuse. It doesn't reach the surface of the Earth. What on Earth are you prattling on about? I've just read that again, and it still looks like some sort of primitive AI software has just put words on a string. It makes no sense on any level. Why do people do this? It is utter junk. So? When I visit? I should be sure to take my parasol? Castro, I know there are accusations that it would be more accurate to term "Artificial Intelligence" as "Artificial Stupids". However, reading annoyingmousies gibberish is obviously an issue of a "Natural Stupid". deer granny, Is there any possibility of any modern research with equipment more advanced than your ouiija board, that would be acceptable to your claims defining "plasma" as a transcendental phenomena? & therefore "Secret Wisdom" held closely by your coven of theosophist cultists? JD Castro Jesus and rrMousie, stop gulping that Suntola yoghoord and start reading about DU literature and the indirect LIGO proof that the GR/QM assumed constant speed of light is actually decelerating as proven by the 2011 GW Nobel at the 'strain' resolution limit of -1.15 10^-21/ms. Once you are able to compensate the interferometric scale changes of isomorphic 3-D space in two local x,y space coordinate directions, even tiny local energy balance disturbances show up as the recorded GW's with directional correlation components. Sun and Moon are by far the most dominant gravitational mass objects in the foreground of the global cosmic picture that together with the new global vs. local physics laws (such as the refined Planck and Mach energy principles) of DU allow today's students and scientists come up with entirely new explanations to recent observations in astrophysics. Gibberish. The GW observations prove you wrong. Get over it. And the rain condenses the region where the key coronal heating can be happening. "We still don't know exactly what's heating the corona, but we know it has to happen in this layer," said Mason. The description of the observation matches very well with Dr. Don Scott's Electronic Sun. The double layer that accelerates the ions into the corona and on to becoming the SW while the electron rain drifts back to the photosphere. Spot on. No it doesn't, and Scott is a complete idiot. And the solar wind is not ions. It is ions and electrons. Anything that accelerates ions in one direction will accelerate electrons in the other. It is observed in a number of wavelengths. Including H-alpha. Now, perhaps an EUist who understands spectroscopy, can explain how free electrons are giving a H-alpha signal? Hint; they can't. It is the wavelength produced when a neutral H atom has its electron move from n=2 to n=3. "It is observed in a number of wavelengths." No I didn't, liar. No free electron is going to give those wavelengths. Lern to scienz, and stop being stupid. jonesdumb also glosses over the fact that the observation falsifies his cherished guesses by the plasma ignoramuses. Wrong, liar. You are glossing over your total ignorance of the subject, and that it just caused you to make a fool of yourself. Yet again. What other wavelengths has this coronal rain been seen in? Try EUV. Tell us where EUV comes from. Hint; it is spelled i-o-n.
And this phenomenon has been known since 1964. So, go away, and make a fool of yourself elsewhere. onesdumb also glosses over the fact that the observation falsifies his cherished guesses by the plasma ignoramuses. ""I probably looked through three or five years' worth of data," Mason estimated. Then, in October 2017, she stopped. She realized she had been looking at the wrong thing all along." "It was a lot of looking," Mason said, "for something that never ultimately happened." "But one part of the observations didn't jibe with previous theories. According to the current understanding, coronal rain only forms on closed loops, where the plasma can gather and cool without any means of escape." In science, that is called falsification. Not so much when discussing jonesdumb's religious beliefs. No, it falsifies nothing. It means that there is an additional process by which this can happen. The previous observations are still valid. Stop lying. And it has nothing to do with the braindead ideas of Juergens and Scott. As I pointed out. Coronal rain is the ***well-known phenomenon*** in which hot plasma high in the Sun's corona undergoes rapid cooling (from ~10^6 to <10^4 K), condenses, and falls to the surface. Coronal rain ***appears frequently in active region coronal loops*** and is very common in post-flare loops. The very first lines of the abstract. Hidden in plain view! No, it falsifies nothing. It means that there is an additional process by which this can happen. I know, I know, endless parameters just like BH and GW pseudoscientific maths claptrap. Yet clearly beyond jonesdumb's comprehension. You are talking out of your arse. Read the paper. All that has happened here is that the phenomenon, which was well-known, occurs in a number of different situations. The authors have found a new situation, but not where they were looking for it, based on some simulations/ hypotheses. This is called science. It is how it works. You suggest a viable hypothesis. you check it, and you find that it happens, but not quite as expected. Then you report it in the scientific literature. Compare and contrast that to the electric universe pseudoscience; you dream up a scientifically impossible scenario, such as the electric Sun (lol), or the electric comet (lol). You don't bother writing it up. You stick doggedly to it, even when it has been falsified by countless observations or lack thereof. That is akin to the belief system of creationists. Whatever it is, it is not science. I realize there is no point to reading any of granny's plasmaspastic woogibberings. Are useful explanations of of scientific knowledge. That educate me with your clear & concise responses. Castrogiovanni, I want to thank you for making the effort. Gee, granny, I guess this means that for anyone who has the misfortune to personally know you? Their opinions of you as being totally useless, are only 99% accurate. I believe the helmet streamers were named after the streamers sometimes attached to the spikes on helmets, not the spikes themselves.